"Peanut butter toothpaste? Of course you can brush my teeth." The time to start dental care with your new bundle of joy is when you first bring her home. Puppies begin getting their adult teeth as early as 3 months. Getting her used to having her teeth brushed, and using the proper toothpaste, helps reduce the risk of dental complications. 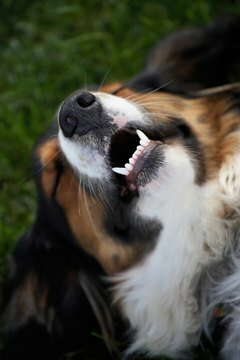 Periodontal disease is a serious and common issue in dogs over the age of 5. According to the ASPCA, veterinarians estimate as much as 85 percent of dogs over the age of 5 suffer from this preventable condition. Regular brushing helps remove food particles and bacteria that builds up in your dog’s mouth and leads to plaque and tartar buildup. By introducing your puppy to regular tooth brushing, she will become comfortable with having your fingers and a toothbrush in her mouth, making regular long-term brushing easier on both of you. While you may be tempted to use the toothpaste you have sitting on your bathroom counter, don’t. Human toothpaste contains fluoride. Given that your dog is going to swallow the toothpaste, this fluoride is likely to give her an upset tummy. When choosing toothpaste for your new puppy, look for brands specifically formulated for dogs. Don’t be surprised by the flavors offered, such as peanut butter, liver or chicken. Remember that this is for your puppy and she is not worried about minty, fresh breath. Check the ingredients label. Some dental products for dogs contain xylitol, which in large doses can be toxic to your puppy. Xylitol can cause a drop in blood sugar and symptoms include weakness, tremors, seizures and liver failure. The best way to avoid your dog ingesting too much of this is to look for toothpaste without it. If you are looking for a natural alternative to commercial puppy toothpaste, holistic veterinarian Ihor Basko recommends a mixture of hydrogen peroxide and aloe vera juice. Combine 2 ounces of each in a small glass jar. For application, he recommends using soft gauze instead of a toothbrush. When you take your puppy to the vet for her first puppy visit, ask the vet what toothpaste he recommends and how often you should be brushing your puppy’s teeth. In addition to brushing, regular chewing helps manually remove plaque buildup on her teeth by friction. Providing regular chew toys and bones will encourage chewing and keep an active puppy engaged, all while keeping her pearly whites cleaned.